Australia has the highest incidence of melanoma in the world, which has a disproportionately heavy impact on the productive years of the lives of young Australians. Curative treatment of metastatic melanoma still remains an unmet health problem. Investigation of genes and signalling pathways that are deregulated in melanoma is a high priority for identification of novel therapeutic targets. My ongoing research objective is overcoming resistance of melanoma to chemotherapy and targeted therapy. The outcome of the study will reveal mechanisms of melanoma drug resistance and result in more accurate and cost effective approaches for the treatment of melanoma patients. 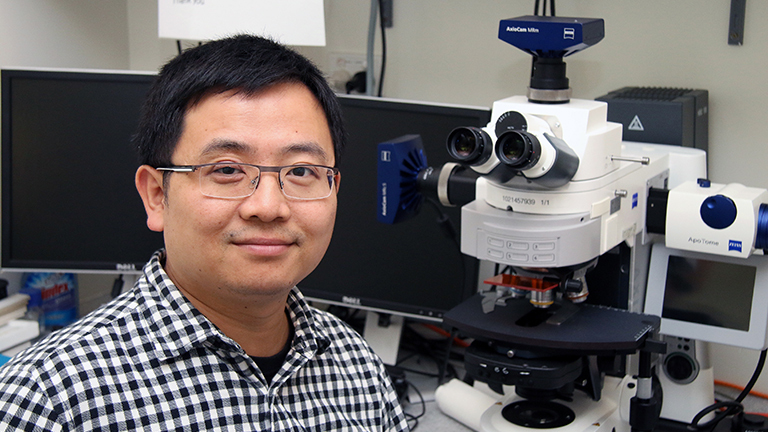 Dr Jin is currently leading the melanoma research laboratory investigating cell death, a group that comprises two visiting academics, four PhD students and one research assistant. In the past five years, he has published 24 research articles in high impact journals including Nature Communications, PNAS, Cancer Research, Autophagy, Oncogene, Cell Death and Differentiation and Stem cells. Since Dr Jin joined HMRI in 2013 he has attracted an NHMRC project grant, two HMRI project grants and a Faculty of Health and Medicine Strategic Pilot Grant. In addition, as a Chief Investigator, Dr Jin has received a number of competitive grants from other sources including the National Natural Science Fund of China and Faculty of Health and Medicine. Particularly, he was awarded Hunter Translational Cancer Research Unit Fellowship in 2013 and a highly competitive Cancer Institute NSW Early Career Fellowship in 2014. Dr Jin has served as a reviewer to assess grant applications for national and international funding bodies including NHMRC and the National Natural Science Fund of China. He also has been invited to review manuscripts for a number of journals including Cancer Research, Oncogene, Neoplasia, Molecular Cancer Therapeutics, Molecular Cancer Research, and PLOS One. In addition to HMRI, Dr Jin actively participates in activities of academic organisations, including American Association for Cancer Research (AACR), the Australia and New Zealand Melanoma Trials Group, Melanoma Institute Australia, and Melanoma Tumour Group of the Hunter New England Area Health. He has ongoing collaborations with a large number of researchers locally, nationally, and internationally. In particular, he has established productive collaborations with researchers in China, including Professor Zhiyin Song of Wuhan University and Professors Mian Wu and Yide Mei of the University of Science and Technology of China. He also provides a consultancy service to other researchers in Newcastle on molecular biology and biochemistry techniques on a daily basis. Dr Jin was among the first to show that p53 (a common tumour suppressor gene) played a pro-survival role in melanoma cells upon endoplasmic reticular stress (a type of cellular 'stress' that occurs in many types of cancer). More recently, Dr Jin has become a leading figure in investigation of the roles of microRNAs (small molecules that alter how genes are expressed) and Receptor-Interacting Protein Kinases in regulation of melanoma cell survival and proliferation. Jin is actively engaged in communications with the general public, in particular, melanoma patients and their friends and relatives. He regularly presents the work in lay language to various community groups, such as members of Newcastle Melanoma Foundation and Melanoma Institute Australia. To develop innovative approaches to improve therapeutic efficacy in the treatment of melanoma.